Genisphere has announced the adaption of its breakthrough 3DNA dendrimer signal amplification technology for use in lateral flow (LF) point-of-care (POC) assays, delivering enhanced sensitivity and facilitating a variety of new POC tests. LF assays are a special and promising suite of POC tests intended to perform rapid diagnosis within clinically actionable timelines. Genisphere’s 3DNA signal amplifiers help in bringing new LF assays to the marketplace, which is otherwise not possible because of very low sensitivity, and provide a competitive edge to test-makers in the POC testing market, which is crowded with products limited by quantitative accuracy and sensitivity. These advancements build on earlier signal amplification capabilities demonstrated in systems such as DNA and protein arrays, ELISA, and Luminex assays. Genisphere will exhibit its 3DNA dendrimer nanotechnology at the 012 American Association for Clinical Chemistry Annual Meeting and Clinical Lab Expo, which will be conducted in Los Angeles from July 15 to 19, 2012. 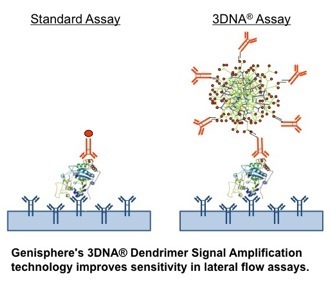 Genisphere’s proprietary 3DNA dendrimer technology has demonstrated a 64-fold increase in sensitivity when compared to typical non-dendrimer assays. This superior sensitivity enables the technology to decrease false negatives and considerably improve the accuracy of outcome readings. This technology will allow the POC market to provide high-sensitive rapid testing for a myriad of conditions, including coronary biomarkers, bacterial sepsis, infectious diseases, environmental and water testing, and food microbiological testing, which are not possible with existing systems. Genisphere’s Vice President and Chief Operating Officer, Jim Kadushin stated that the company has achieved its objective of delivering a powerful and user-friendly reagent that can be used by manufacturers in their bioassay platforms with minimal adaptation and without end user modifications.